Protection of rooms and access areas (gates, barriers) against unauthorized access with a completely IP-based solution for the administration of authorizations, time-level profiles and access logging. The door opening is done easily using RFID media and/or a PIN input to have a user specific logging. Permissions can be granted or withdrawn individually. If necessary the solution can be extended to other rooms/areas or be combined with video surveillance. Protection of non-public doors in or outside the building against non- authorized access across multiple branches. The administration of users and authorizations for single branches ought to be done centrally and integrate all sites into one system in order to keep the administration effort small. All access is documented in a central logbook. Additionally, critical areas are to be video controlled for an even higher level of security. The complete installation is fully IP-based, without wireless or battery- powered components. Your company has one or several IT- or technical rooms that are to be protected against unauthorized access. The administration of the accesses shall be realized with a fully IP-based solution. An opening of doors can take place using RFID-media, the input of a PIN- code or as a combination of both. All accesses are logged and are subject to the configured access profiles. The installation shall be designed as a fixed wiring without wireless or battery-powered components. Kentix MultiSensor systems monitors and provide early warning of more than 35 mission critical threats. The highlight here is, Kentix systems only needs a few system components. 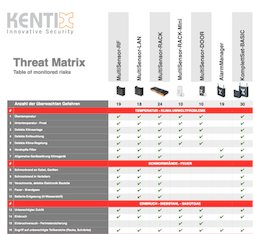 Which Kentix product is monitoring which risks in your IT infrastructure, clearly illustrates the new threat-matrix. This helps you better to understand the required products and their benefits. A physical monitoring of the IT infrastructure and the early detection of the most important risks is part of the IT basic protection. The Kentix threat-matrix shows through which everyday hazards failed IT systems and thereby suffer high losses the companies concerned. To find out how many threats which device detects please go to products.